CAPE CANAVERAL, Florida -- The launch of a United Launch Alliance Atlas V 401 rocket carrying a National Reconnaissance Office (NROL-33) satellite from Space Launch Complex 41 at the Cape Canaveral Air Force Station in Florida is scheduled to launch on Thursday, May 22, 2014. The launch window opens at 8:45 a.m.
Few details have been released about the mission other than that it is "in support of national defense." The most recent forecast issued by the U.S. Air Force 45th Weather Squadron predicts an 80% chance of overall permissible weather conditions for launch. The primary weather concern for launch is cumulus clouds. NROL-33 will be the 46th Atlas V mission since the vehicle’s inaugural launch in 2002. It will be the sixth of 15 planned missions ULA is slated to launch in 2014, and ULA’s 83rd since the company formed in 2006. Where Can You Watch The Rocket Launch? A. The best place to watch the launch is from the Canaveral National Seashore just north of Kennedy Space Center. Admission is $5 per car. The park opens at 6 a.m. Visit the U.S. National Park Service website for directions and more information. B. The Kennedy Space Center Visitor Complex is opening at 7 a.m. for the launch. There are several locations available for guests to view the launch. General admission tickets required. Visit the Kennedy Space Center Visitor Complex website for directions and more information. 1. Titusville, Florida southward along the Indian River on the east side of US Highway 1. 2. Between Merritt Island and Cape Canaveral along the north side of State Road 528. 3. Port Canaveral, with best viewing and paid parking available at Jetty Park. 4. Along the beaches of Cape Canaveral and Cocoa Beach, Florida (there is metered parking in Cocoa Beach that only accepts quarters, so bring some change). 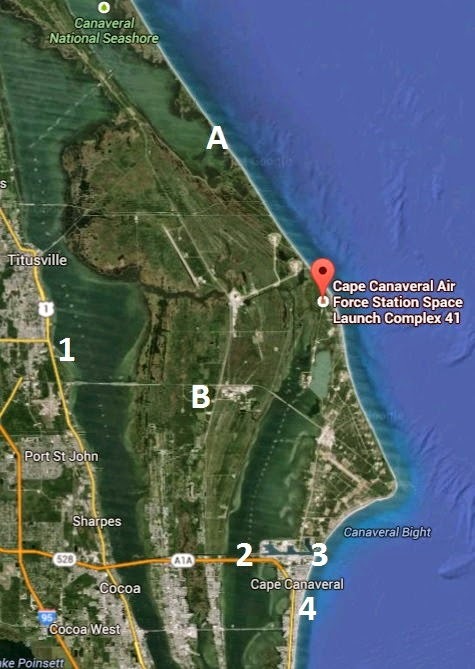 Map of Launch Complex 41 at Cape Canaveral, Florida. Credit: Google. Rocket launch biewing locations added by Brevard Times.